What combination of keys do I press to produce the command symbol (⌘) on Mac OS X? 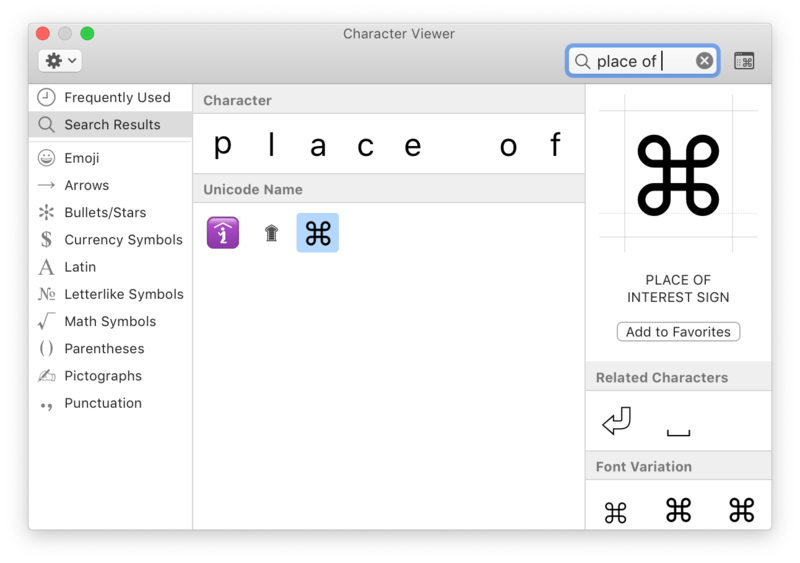 If you're just looking for the Unicode versions of Mac OS X keys, you can use this site to copy and paste them from the text box. More generally, Mac OS X provides a pane to insert special characters. You'll find it under Edit -> Emoji and Symbols in any program that takes text input. 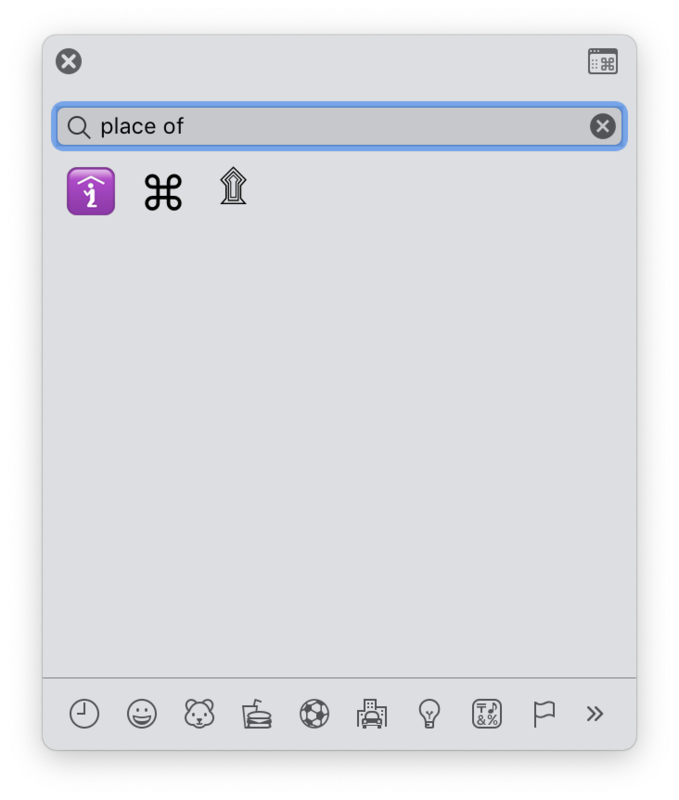 The Command key symbol can be found by searching for it's name "place of interest". To insert the character, double click it. Go into System Preferences -> Keyboard -> Input Sources, click "+", scroll to "others", select "Unicode Hex Input" and click "Add"
From the input source selector in the menu bar, select "Unicode Hex Input"
To enter a Unicode character, hold down option and type the 4-digit hex code for the character and it will be inserted. In this case, it would be option+2318. You can also type ⌘+^+Space to bring up the characters menu, then start typing to search, and search for place of interest, then press enter to start selecting them, then tab to the correct result, then enter again to insert it. Sounds like a lot, but it can really be narrowed down to ⌘+^+Space, typing pla, and then two presses of Return. 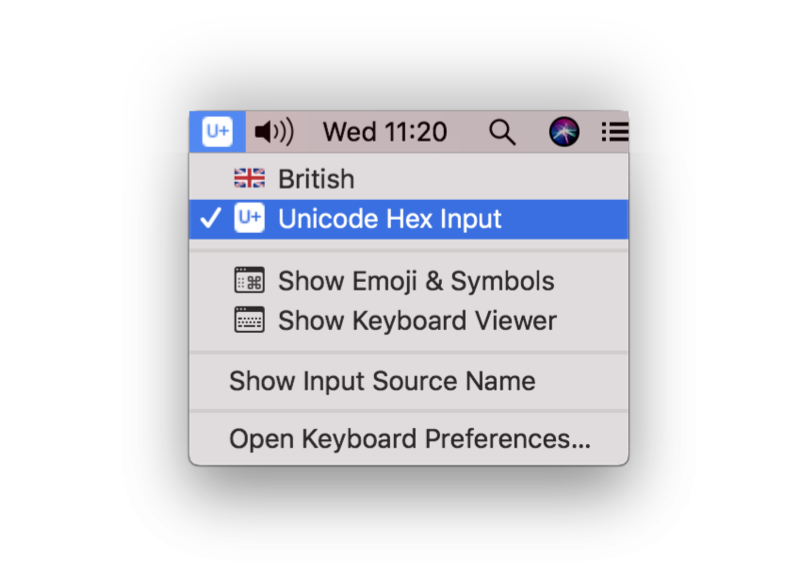 I also found it hard to find a straight answer for this, so I just went into System Preferences > Keyboard > Text and created a use symbol and text substitution option where when I type (cmd) it replaces it with the command symbol. With the document open, place the cursor where you want the symbol, Open the Character Viewer as described above. Type "Place of Interest" in the character viewer search field. It shows up on at the bottom of the window. Double click it and it shows up where you placed your cursor. Save it to your favorites in the Character Viewer window to make it easier to find next time. This under OS 10.9.1 "Mavericks"
You can also add Your favourite characters to "press and hold" key behaviour. Here's explanation how to do it on apple stackexchange: How to add characters to the press and hold character picker in OS X Lion? Keep in mind that this is done inside System directory, so be careful and remember that there's a chance of losing Your setup after upgrading the OS. If you have TextExpander, one can also make a snippet for it, ala Dr. Drang. He also has a Keyboard Library with snippets for a host of keyboard symbols available. This is the simple way on how to do it. Copy '⌘' into the box. Now whenever BetterTouchTool is open all you have to do is press 'Option+C' and it automatically types the '⌘' symbol. You only have to do steps one to eight once. For what it's worth (on OSX and maybe Windows): In Libre Offices's Writer I found the symbol as the 5th entry in both the LiHei Pro and LiSong fonts. Alternately you could use Key Graphics. The thing is if you are typing it out always use Command. The Mac Characters popup is definitely the straightforward solution if you need to insert some chacters once in a while. 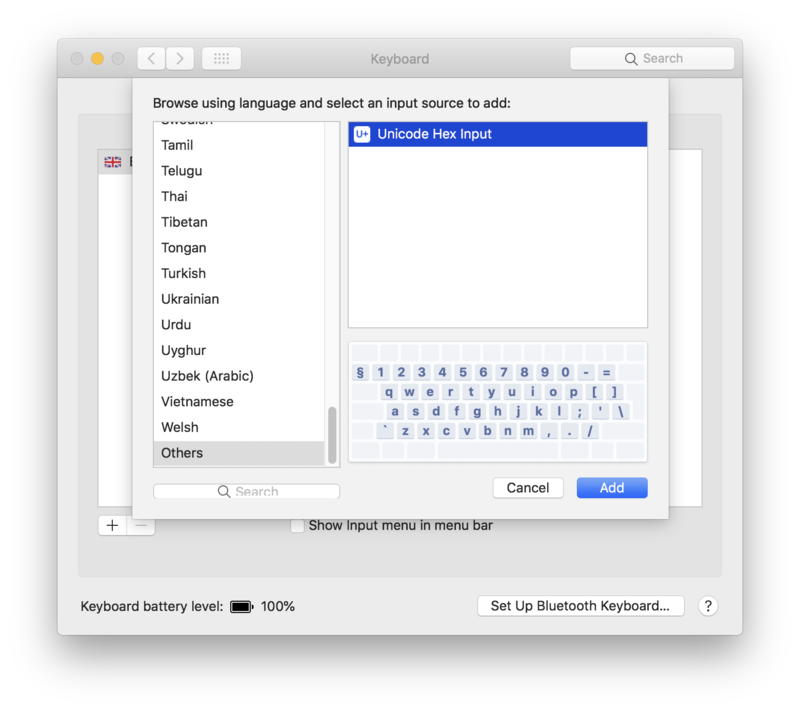 But if you regularly need to use Unicode characters which are not present on your keyboard then a radical solution would be creating your own keyboard layout with Ukelele that will map those characters to your physical keys. The app is only used the create an OSX compliant layout file (XML or bundle) which can then be added via Preferences > Keyboard > Input Sources > ＋. With Ukelele you can clone your existing standard keyboard (File > New from current input source), and remap any of the keys to your liking. In the default keyboard layout holding the Option key ⌥ in combination with any letter/symbol key will insert extended math characters which normally are never used, e.g. œ∑´®†¥¨ˆøπ“‘«æ…¬˚∆˙©ƒ∂ßåΩ≈ç√∫˜µ≤≥÷¿˘¯Â˜ı◊Ç˛¸ÅÍÎÏ˝ÓÔÒÚÆ»’”∏Øˆ¨Áˇ‰„„. Holding down Shift+Option will give you yet another set of special characters. 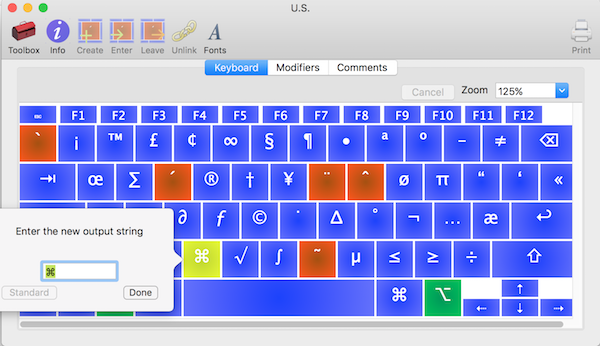 With Ukelele you can remap Option+key and Shift+Option+key to anything you like including Unicode emoji characters. You can pick the required character for mapping using the built-in Characters app as explained in other answers. While this might be overkill for a single character, it actually makes sense when you want to tweak other things on your keyboard and have complete control. Once you have created your custom layout you can use it on any number of macs by simply copying it to ~/Library/Keyboard\ Layouts and then adding it in Preferences without the need to use any third party apps. The layout can be installed directly from Ukelele via the File > Install option. Once installed you still need to add it manually via Preferences > Keyboard. Disclaimer: I am not affiliated with the app author. I simply found the app very useful in solving some issues with my keyboard which had some keys in the 'wrong' place. Give the macro a name like "insert ⌘"
Add "New Action" and choose "Insert Text by Pasting"
Now whenever you type the string "=cmd" a "⌘" will be inserted. I normally use "SHIFT + ALT + K" to generate a  Symbol. Not the answer you're looking for? Browse other questions tagged macos character keyboard . How do I type the symbol for the command key? How to enter in the apple symbol not in a web browser? How can I make a keyboard shortcut for an item with unicode characters? What does this keyboard shortcut symbol indicate? What is the source directory? What is the meaning of the “§” symbol (on the upper left corner of the mac keyboard)? What does using right/left/up/down key and option/command key together mean?